Dot Lenthall is a great friend who does amazing work with children in our school system. She sent me a copy of her new book "Don't Just Stand There" which has the subtitle of "5 steps to protect your child from school bullying." Parents usually are not familiar with the way schools work. They are bombarded with words and procedures which only schools use. The exclusivity of schools is confidence-shaking, making it difficult for parents to request that action be taken on behalf of their child. Parents are helped through the bewildering process, to facilitate what is always an unpleasant course of action when a child is bullied. The rights of the child and the parent are made clear so that parents can confidently request effective help from their child’s school. Dr. Dorothy Lenthall worked in schools for many years, first as a teacher and later as a school psychologist. Being surrounded by students seeking help with the problem, she realized that effective anti-bullying programmes urgently needed to be put in place. She sought advice from world leaders on how to approach the situation and researched the effect of bystanders on bullying for her Doctorate in Communication. 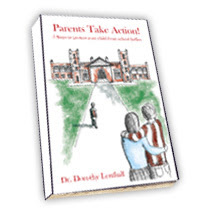 The plight of parents not knowing where to turn to get effective help for their bullied child was the driving force behind the writing of this book. She works as a psychologist in Perth, Western Australia and teaches in a voluntary capacity at the Fremantle Community Centre. She is married with three adult children and lives in Fremantle.